Spartan Slots Casino has it all! 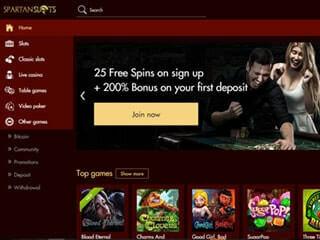 Look for all the no deposit bonus codes available, the great games, offers, tournaments and more. Upon joining Spartan Slots you’ll enjoy all this great casino has to offer. Your fun and pleasure is their goal. This online casino is regulated under the jurisdiction of Curacao. It is one of ten casinos in the Deckmedia Group. This group is famous for having relatively small numbers of games but all of which are enormously entertaining. The group is also known for higher than average payout rates. The payout rates at Spartan Slots average about 98%. The casino tries to process all withdrawals in less than 72 hours. The main reason that withdrawals take longer than deposits is that no hacker will deposit into your casino account but hackers may try to withdraw your money. So, even though the casino uses sophisticated encryption software to guard your money, they take no chances and make 100% sure that the person asking for a withdrawal really is you. Spartan Slots offers a great welcome package but the promotions and bonus codes only begin there. They run bonus offer every day! The 150 games at the casino are the crème de la crème of the casino’s three providers. You’ll always be able to say that you had a great time playing at Spartan Slots! 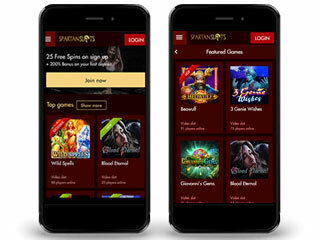 Spartan Slots offers three gaming platforms: download, instant play, and mobile. We suggest playing in instant mode or mobile. Instant mode gives you quick access to all ten Deckmedia casinos. It doesn’t take up valuable space on your hard drive. The mobile app is so easy to install that you’ll be happy that you downloaded it. The graphics on both the mobile and the instant play platforms are as good as the graphics on the desktop download platform. This is a revolution in online gaming as the best casinos now no longer require downloads to provide stellar graphics. Spartan Slots looks fantastic in all three formats! 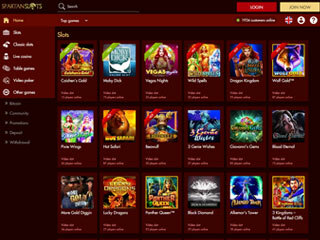 Spartan Slots runs the top games from three developers: Octopus games, VIG, and Betsoft. Slots are the dominant category. The video slots are so much fun that you’ll forget that you also want to win! The slots have all the extras of video slots: Wild and Scatter symbols, free spins, bonus rounds, multipliers, stacked reels, cascading reels, and more. Now, all these are not on every slot. But the slots are all so good that you’ll happily sample each one! Complementing the slots are table games and video poker. Table games are the popular blackjack, roulette, craps, pontoon, and casino poker. Video poker has about 30 distinct games. It takes only a few rounds in free play mode to catch onto the nuances of each individual video poker game. The two things to remember in video poker is that average payouts are often more than 99% and if you play with a strategy card you can get the upper hand against the house. Rounding out the selections at Spartan Slots are scratch cards and bingo. After you’ve gotten your full set of welcome bonuses, you’ll want to take full advantage of all the subsequent bonus offers. The casino offers tons of bonuses every day – no deposit bonuses and deposit bonuses alike! Be sure to check them all – very lucrative, indeed! In addition to bonus offers daily, the casino runs promotions on a weekly or monthly basis. The casino sponsors many tournaments. These are listed under “promotions” in the casino lobby (home page). The tournaments are open to all and the top prize is always guaranteed so you’re sure to have a chance to win. On aspect of bonuses is that players really don’t like using bonus codes to access bonuses. Spartan Slots makes getting bonuses easy as they don’t use bonus codes. The most common promotion at any reputable online casino is comp points. At Spartan Slots, the comp points promotion is called the VIP Club because they consider every player to be a VIP. There are six status gradations in the VIP Club. Every bet becomes points based on the game, the amount bet, and your personal status in the VIP Club. Sometimes the casino runs a promotion in which you can get double, triple, or more VIP points in specific games. When your number of points reaches the watershed level, you can redeem them for casino credits. When your VIP points grow to a higher level yet, you’ll be awarded a personal casino representative who will help you devise special promotions, gifts, trips, cruises and excursions chosen with just you and your family in mind. The casino uses the best available SSL encryption software to protect your money. If you’ve ever bought anything online, you’ve used the same level of encryption to protect your money and your privacy. The casino rightly sees itself as no less a bank than your…. bank. It is entirely reasonable to expect the customer service office to be open round the clock. We all know the frustration of calling a company and hearing “our regular business hours are…”! This never happens at Spartan Slots! Their service office stays open around the clock, during hurricanes, blizzards, holidays, and coffee breaks. The casino knows that you deserve 24/7/365 service. You can reach a representative by email, telephone, or chat. We would not have written this Spartan Slots Casino Review were it not a casino that reaches our own strict standards. The casino follows the high standards set by management at Deckmedia and offers great gaming entertainment. Try out Spartan Slots Casino now!